Forget your usual neat rows of traditional graves – this cemetery is an impressive mish mash of stones and monuments, with some even tailored to represent the occupation of the deceased. There are graves in the shape of spaceships, cups and other strange monuments erected for the former employees of astronautical and coffee companies. There is even one for a termite worker from an insecticide company representing all the insects killed by their products. Many of the memorials are covered with red hats or gowns. The red clothed Mizuko Jizos figures represent the babies and children who have passed away and are placed by parents to protect their children as they make their way to the afterlife. As well as graves dedicated to more recently deceased folk, the cemetery has strong links to the past. The graves in Okunoin cemetery lie on either side of a long path which winds through cedar trees for around 2km and ends at the mausoleum of Kobo Daishi – the founder of Shingon Buddhism. Shingon Buddhism was introduced in Japan in the early 9th century by Daishi. He built a temple on the secluded mountaintop of Koyasun so he could go there to meditate in peace. Since then, more than 100 temples and monasteries have sprung up around the sect’s headquarters. Daishi’s mausoleum is closed to visitors, but people leave food outside for the deity, while monks reflect in silence and recite sutras – aphorisms or teachings that are part of the religious tradition – in low voices. Just outside the mausoleum is Toro-do or Torondo – a lantern pavilion, where 10,000 donated lanterns hang. The cemetery is open at night and visitors enjoy walking through the paths where the glowing lights swing in the breeze. Two of the lanterns are said have been burning continuously since 1088 AD, one from a former emperor and the other from a peasant woman who sold her hair for a lantern to pray for her deceased parents. 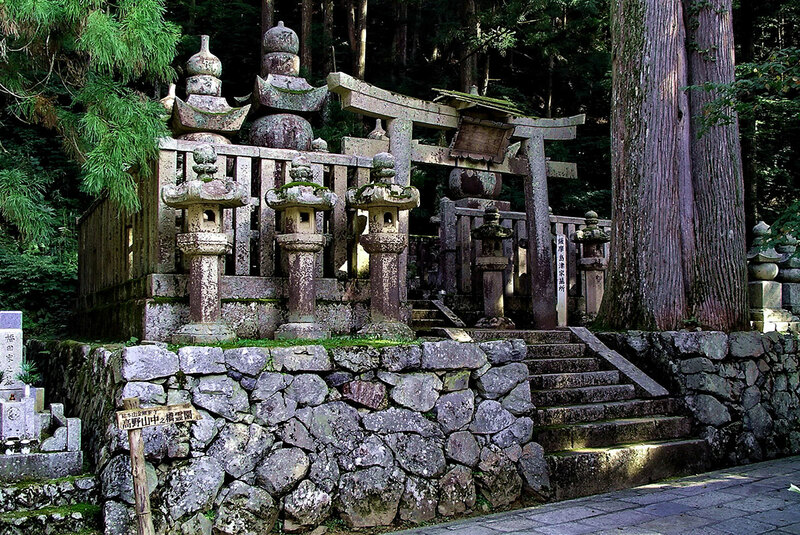 Okunoin itself is home to more than 200,000 graves. Many people wish to be close to Daishi in death in order to receive salvation. Therefore they have had their tombstones erected nearby. Photography, food and drink are prohibited in the cemetery, while the entire region is a designated UNESCO World Heritage Site. People, as well as pets are still being buried in Okunoin. These include historical people, war heroes, royalty, business leaders and children. There are also Jizu statues which are lined up by a stream. Locals pray at the statues, throwing water, bowing their heads, and offering respect and prayer.